Seeing inside a battery with a unique NMR "camera"
Results: When working on a unique lithium-germanide battery with colleagues from the National University of Singapore, scientists at Pacific Northwest National Laboratory encountered a catch-22: They knew an exciting reaction was occurring inside the battery that increased its energy-storage capacity dramatically-but they could not observe the reaction. The researchers needed to understand the process, but taking the battery apart caused the reaction to stop. To solve the problem, the PNNL scientists encapsulated the battery cell in a plastic holder to allow magnetic waves to penetrate it and developed a powerful nuclear magnetic resonance (NMR) technique to "see" and understand the electrochemical reactions taking place inside. The team produced a high-storage-capacity, lithium-germanide battery and demonstrated how their unique NMR "camera" can be used to examine it and gather data about reactions that can be observed only as they are happening inside a battery. Why It Matters: Lithium-ion batteries have many uses besides powering cell phones and laptops. Developing safer, more powerful cells with longer life is a worldwide challenge, requiring deeper understanding of electrochemical processes. Sponsors: Part of the NMR device was originally developed with Laboratory Directed Research and Development funding. 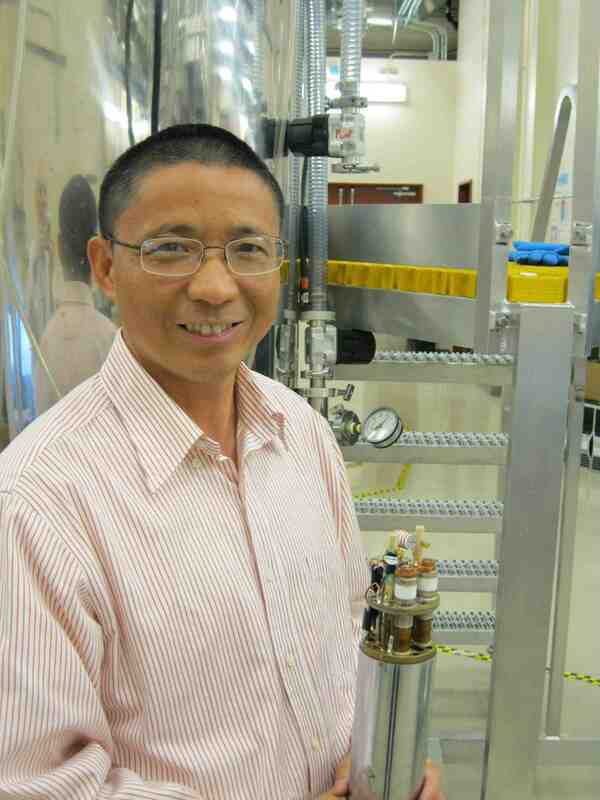 The NMR work with the lithium-germanide battery cells was supported by a grant from the University of Singapore. User Facility: The scientists performed their experiments at EMSL, the Environmental Molecular Sciences Laboratory, a national scientific user facility sponsored by the U.S. Department of Energy's Office of Biological and Environmental Research, located at PNNL. Research Team: Kian Ping Loh, Wei Tang, Yanpeng Liu, and Chengxin Peng, National University of Singapore; Jian Zhi Hu, Mary Y. Hu, and Xuchu Deng, PNNL; and Ming Lin, Agency for Science, Technology and Research, Singapore. Reference: W Tang, Y Liu, Chengxin Peng, Mary Y. Hu, X Deng, M Lin, Jian Hu, and KP Loh. 2015. "Probing Lithium Germanide Phase Evolution and Structural Change in a Germanium-in-Carbon Nanotube Energy Storage System." Journal of the American Chemical Society 137(7):2600-2607. DOI: 10.1021/ja5116259.